For the Kinesiology therapy treatment, clients will be asked about their lifestyle, their health concerns, problems in their life, their past health, their family and any current life goals. Muscle testing is used to determine the session; to gauge the particular kinesiology balances needed to meet clients’ concerns. The priority areas requiring work are identified. Kinesiology balances variously use essential oils, crystals, flower essences, polarity magnets; or homeopathic and radionic copies of toxins, environmental pollutants for de-toxing. 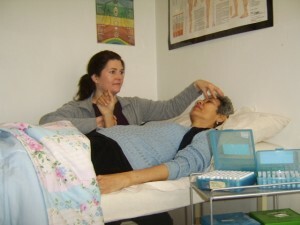 Protocols from Health Kinesiology and other kinesiologies may be included such as Emotional Freedom Technique (EFT), touch for Health (TFH) and Assimilation, and Systematic Kinesiology. Acupressure points are held to being all aspects of the person’s subtle energy into harmony and balance. The body’s bio-energy’ (or internalised Chi that gives life force via the meridians chakras, auric field) is restored. Kinesiology facilitates change in the subtle energy system to maximise this inner resource. Other positive shifts for the person often happen soon after the session. Home self-help advice such as an affirmation, changes to diet and other particular lifestyle points, something specific to do, priority things to avoid, may be suggested to support the subtle energy work that has been done. A flower essence and a nutritional supplement may also be recommended. The work that is done during the session helps the client be able to be more relaxed, and provides a deeper understanding and introspective connection as to.the causes of their symptoms. This also has the affect of hekping the clients feel more in control of their health issues. The fact that the work that is chosen and checked using muscle testing/checking means that it is exactly what the body’s inner oracle has chosen and knows that it needs rather than another practitioner working only from their knowledge and intuition. The kinesiology work is done with the client lying on the therapy couch, fully clothed. Each session is 50 minutes to an hour and the session fee is £65. Please contact Claudia Benson directly (tel: 020 7 272 4121) to arrange and appointment by phone; or email using the ‘Send a message’ in the Contacts tab. Please note that the clinic requires one days notice for cancellation of appointments. If you find you need a different time on the same day as you have already booked I will do my best to accommodate you if there is space in my diary. Otherwise the full session fee would need to be charged at £65. Do please note that all complementary therapy including kinesiology and healing, are not intended to replace medical treatment and care. Kinesiology and reiki can be beneficial alongside this. Complementary therapists are not allowed to diagnose medical conditions and kinesiology will not provide such a diagnosis- rather it can offer life coaching, stress and weight management support, emotional well being; helping the immune system by reducing overall stress. As with all therapy no specific results can be guaranteed.